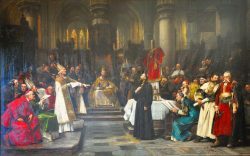 Hus was a Czech priest, who, a century before Luther, called for a reform of the Chuch and was burnt at the stake. His death set off a religious, political and social revolution in Bohemia and 18 years of war. He was born in southern Bohemia. Living in poverty, he studied at the University of Prague and was ordained priest in 1400. He became confessor to the queen of Bohemia and dean of the theological faculty in Prague. He decided to preach in Czech and there were often more than 3000 people who came to listen to him. He undertook to translate the Scriptures into Czech, which helped to stabilize the Czech language. At the same time, he desperately strove for the Czech people to become masters in their own country ( in opposition to the emperor, the king of Bohemia). He also defended their right to use their national language in public life. In this way, he embodied the hopes of the Czech people. 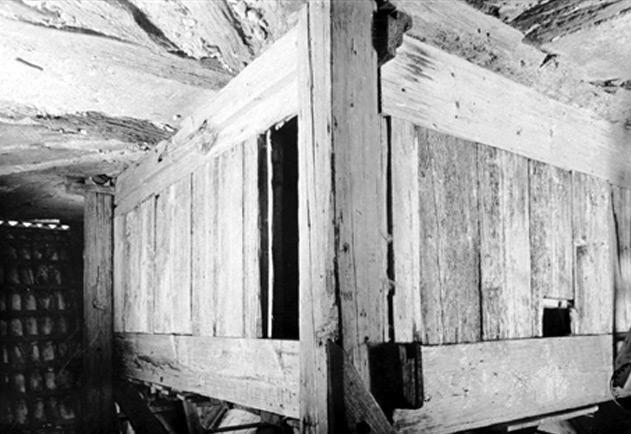 Hus: his prison cell near Constance © S.H.P.F. He protested against the ecclesiastical system, he preached in favour of reform in the Church and advocated a return to the poverty recommended by the Scriptures. Indeed, the Scrptures were the only rule and every manhad the right to study them. 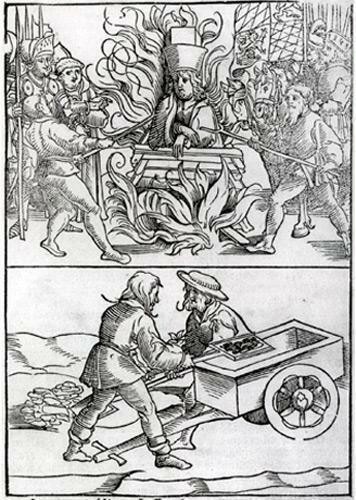 In Questio de indulgentis (1412) he denounced the indulgences. He admired Wyclif’s writings and defended him when he was condemned as a heretic. He was excommunicated. 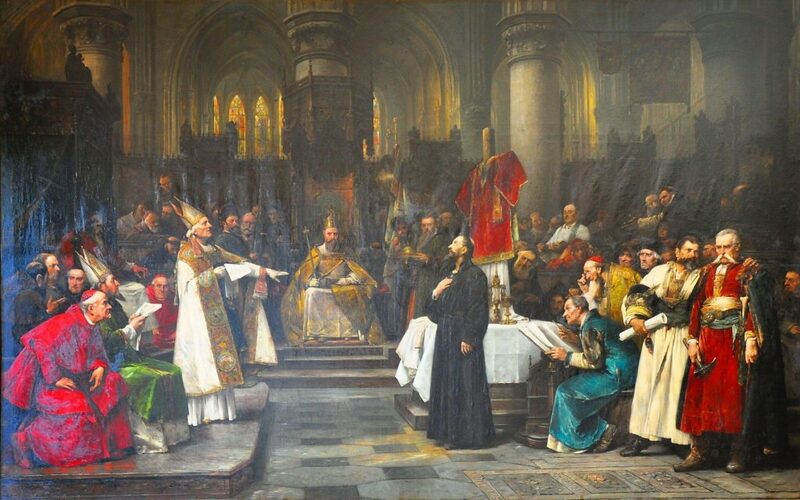 An interdict was pronounced over Prague and he had to leave it and go to southern Bohemia, where he preached and wrote theological treatises, notably the Tractatus de ecclesia (1413), known as « The Church ». In 1414 he was summoned by the Council of Constance so he travelled there, the Emperor Sigismund having assured him of safe-conduct for the journey. However, he was declared a heretic and burnt alive in 1415 – his writings were also burnt. He was as concerned about social justice as religious morality ; he was both a patriot and a reformer of the Czech language. Execution of Jean Hus and scattering of the ashes © S.H.P.F. On 30th July 1419, in Prague, a number of prominent Catholics were defenestrated and fell to their deaths ; this was the beginning of the Hussite rebellion ( the Hussites defended the ideas of Jan Hus) ; they offered tough resistance to the five European crusades who had been sent by the pope and the King of Bohemia to curb « those heretics ». the punishment of mortal sins. Some radical Hussites advocated the sharing of possessions, absolute equality and universal priesthood. the possibility of reading the Epistles and the Gospel in Czech. In 1434, the moderate Hussites, who had accepted compromise and who had allied with the Catholics, overcame the more extreme elements of the movement at the battle of Lipany. The « Diet » of Jihlaoa put an end to war in 1436. 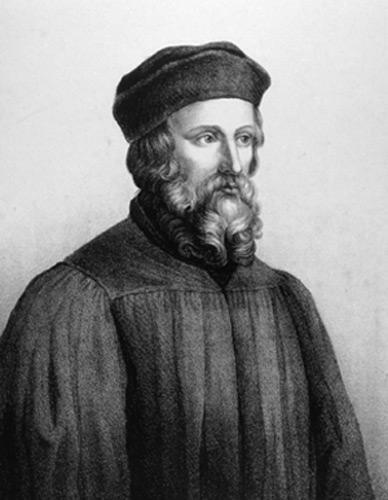 Jan Hus can be seen as a precursor, a century ahead, of the great Reformers of the XVIth century, and of Luther in particular, who undertook to write the preface to his works when they were later printed in Germany. Two thirds of the Czechs joined the Lutheran Reformation by accepting in 1575 a confession of faith inspired by the Confession of Augsburg.